You can eat it with a spoon! But control yourself, please! It is delectable on quick breads, bagels, English muffins and low fat graham crackers. Do not substitute sugar for NutraSweet. 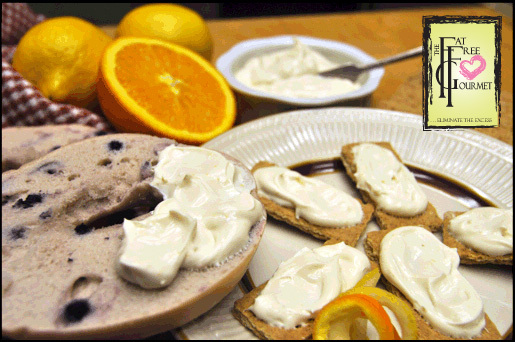 Sugar will break down the fat free cream cheese and turn it into liquid. This spread keeps well in the refrigerator. It's always nice to have on hand for breakfast or a snack. Place all ingredients in the bowl of an electric mixer and beat on medium high speed until smooth and fluffy. Serve or store in sealed container in refrigerator. Yields approximately 1 cup of spread. Copyright 1995-2014 Melinda Perino-Bebb. All rights reserved. Information may not be copied, printed or otherwise reproduced without the written consent of the owner.